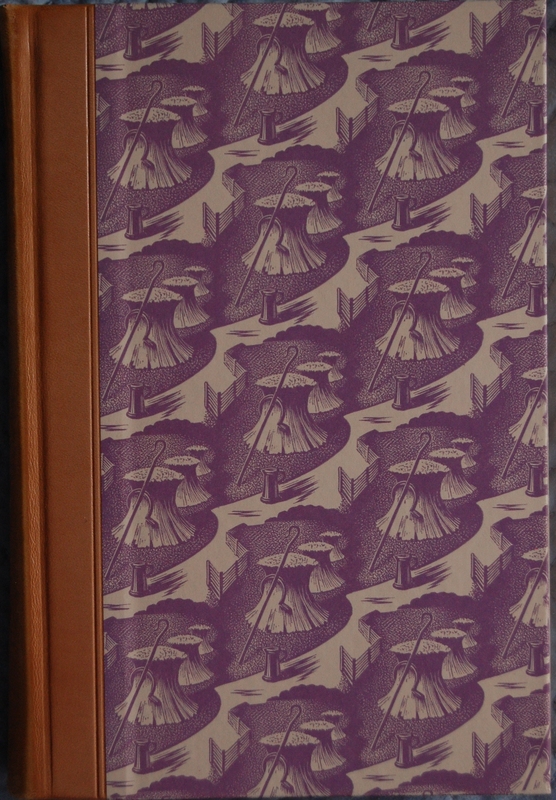 Front Binding – Thomas Hardy’s second LEC, issued in 1958 two years after Tess of the D’Urbervilles, continues the stylistic motif established by its predecessor. Curiously, in 1942 the Heritage Press started off this series with The Return of the Native, but the LEC never reprinted it for their members. 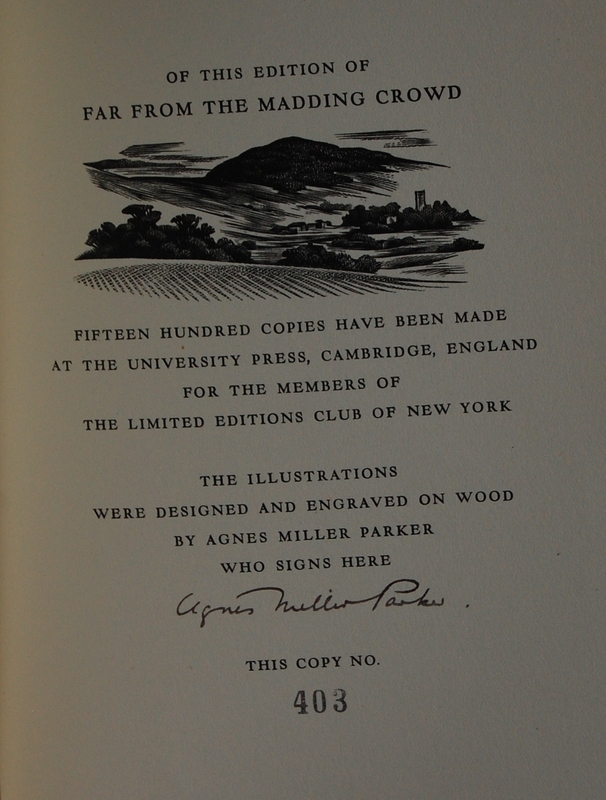 Agnes Miller Parker was the illustrator for it, too, and the design is identical – repeating art from Parker over the boards in a vibrant color (in this case purple), so who really knows what happened. 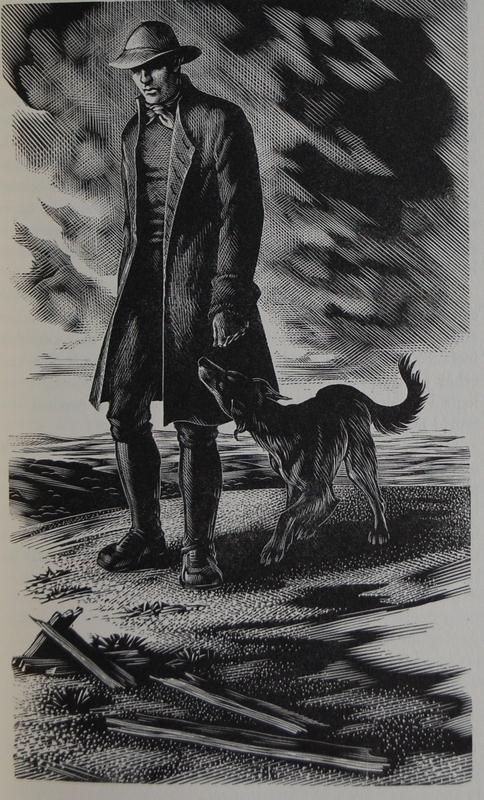 At any rate, in 1956 the LEC began their four book series of Hardy – following Far from the Madding Crowd was The Mayor of Casterbridge in 1964 and Jude the Obscure in 1969. 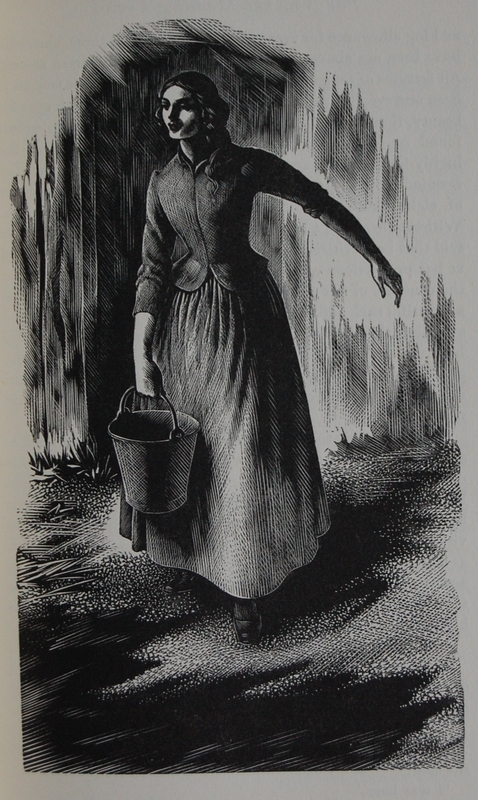 Mrs. Parker was among the more productive women artists on George Macy’s commission list, with a solid seven assignments for the LEC and two Heritage Press books. She began with the lovely Elegy Written in a Country Churchyard by Thomas Gray back in 1938 (I have the Heritage of this, so look forward to it! ), began her Hardy run with the aforementioned Heritage Return of the Native, and then had a brief hiatus until 1953, where her artistic talents were called on, alongside John Austen, for The Faerie Queene. She then completed the four remaining Hardy novels, a Heritage compilation of Shakespeare’s Tragedies in 1958/59, and a Poems of William Shakespeare in 1967. Jude the Obscure would be her final contribution to the Company. She is quite well known for her George Macy Company output, which is deserving, as she shone brightly among the many astounding artists who provided artistic assets to the LEC and Heritage Press. The book was printed at the University Press at Cambridge, but that’s about all I can tell you about the design process of the book due to no LEC letter. A.G. Hoffman did Return of the Native, and John Dreyfus designed the Heritage Jude the Obscure, so I can make an assumption that the latter performed the same task here due to the similar choice in design and the surge in Hardy’s novels being produced in this period, but I won’t proclaim that as fact until I hear from one of my LEC compatriots. Spine – It’s leather, I can say that much! Slipcase – The slipcase also has the Parker design from the boards on its sides, which is a nice touch. 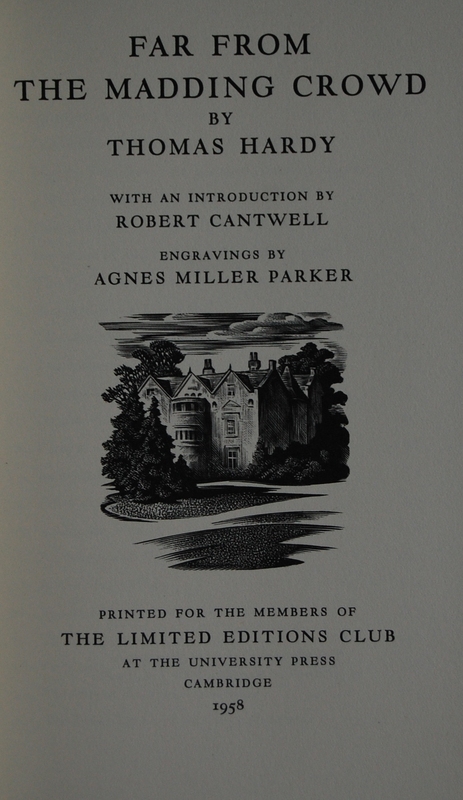 Title Page – Robert Cantwell has written up the introduction, and Parker’s wood engraving of a stately manor sets the mood. I haven’t read this book, but I’m curious as to how it goes thanks to Parker! Signature Page – Parker’s signature is here (and it’s among the nicer ones! ), and this copy is #403. Studious viewers of this blog may recollect that number, and with good reason, as I’ve snagged several LEC’s from this member from my favorite bookshop. Shame they seemed to make the letters vanish! Signed Print of Page 5’s Woodblock – From what I can gather, every member was sent a Japanese paper print of Parker’s Page 5 woodblock, which Parker signed and dated. Jude the Obscure would also be issued in the same manner. 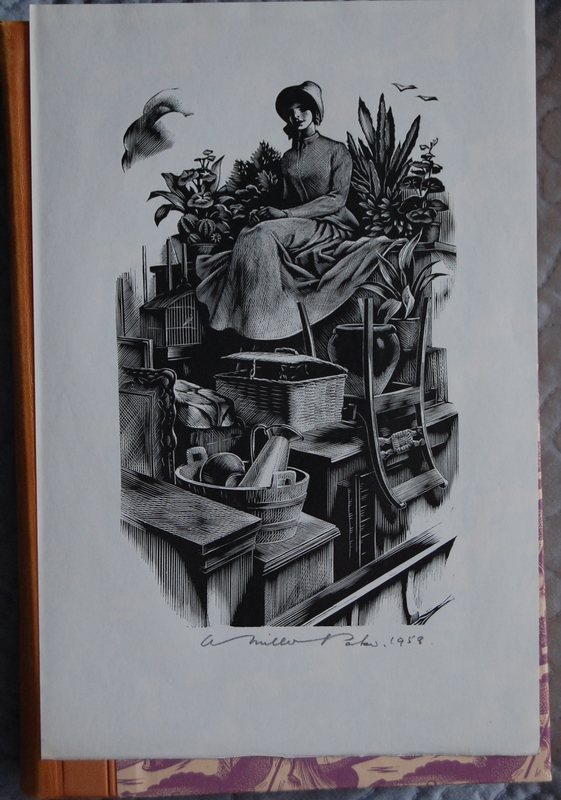 The print sold me on the book – I love Parker’s work, and I’m trying to figure out some way of framing this that won’t damage it. Page 17 – Dynamic rendering of a fairly static, ordinary exercise – that’s talent! 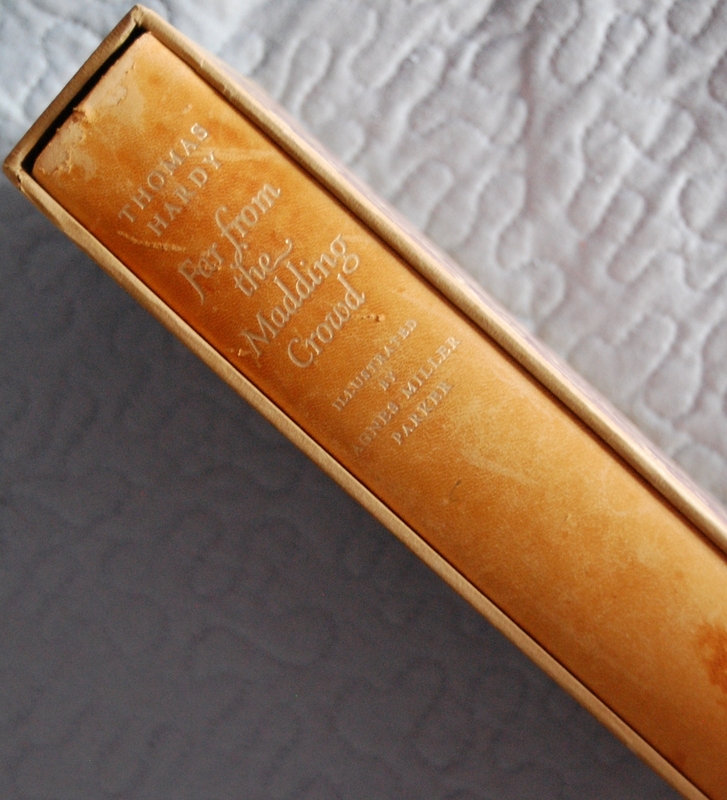 Personal Notes – I bought this at my favorite book store in Monterey, California, for $80. It’s currently the most expensive LEC I’ve purchased, but the print made it worth it to me, and it’s nice to finally have a signed Parker in my collection. If you have a LEC Newsletter, please drop me a line here or through the comments at my thread about this blog at the George Macy Devotees @ LibraryThing! I could use extra insights into this book. Thanks! You are currently reading Limited Editions Club – Far from the Madding Crowd by Thomas Hardy (1958) at The George Macy Imagery.